According to our sale report 2018, stable mat is one of our best selling products. Our regular size is 1.83m*1.22*18mm, also can be customized according to customer drawings. It can be used in livestock holding yards, slippery inclines, loading ramps, stock transport, entries and exits, wet areas, etc. In 2018, the stable mat was sold to the European and Australian markets. We have never received any customer complaints. As a professional international trading company, we have our own rubber factory which is 160kms away from Beijing international airport and 180km away from to Tianjin port. Welcome to visiting our factory. Next: When is the best season to place orders? How much do you know about rubber truck mudflaps? If you are looking for rubber truck mudflaps factory, please feel free to contact us! 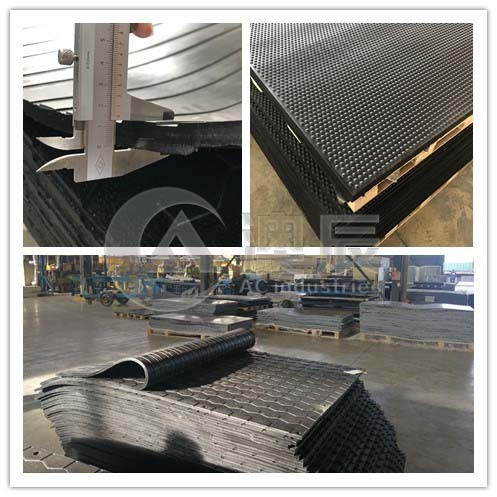 If you need rubber sheet flooring​ such as SBR rubber sheet, NR rubber sheet or cloth insertion rubber sheet, please feel free to contact us!